See it on your phone! 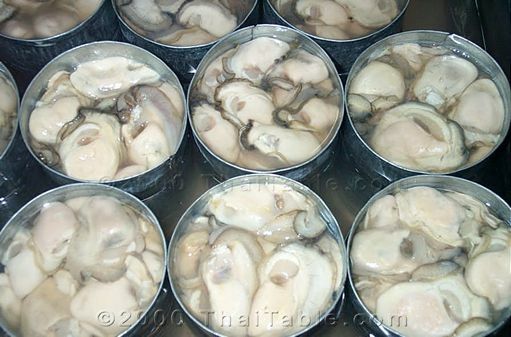 All oysters vary by region and the ones you get in Thailand are huge and sweet. If you ever get a chance to go to Thailand, try the fresh oysters that are served with fried shallots and lime and a Thai vegetable with little leaves that close (gra tiin) that you can't get here in the states. The oysters are so big that it takes two bites to eat one. Stir fried rice noodles with chives, bean sprouts and shrimp. Stir fried rice noodles with Chinese broccoli and soy sauces. Ripe mango served on a bed of coconut milk soaked sticky rice. Stir fried eggplant with basil and chili pepper. Copyright © 1998-2019 ThaiTable.com and it's owners.